Does the thought of a plunging stock market give you heartburn? In 2018, for the first time since 1990, the Standard & Poor’s 500 stock index experienced so-called corrections twice in a single calendar year—dropping by at least 10% from its recent highs. Another correction began in late 2018, and the index had not reached new highs as of our press time in early 2019. Analysts expect continued volatility throughout 2019 amid continuing fears that a recession and bear market may not be far off. So what can you do to settle your stomach if abandoning the market seems too drastic a step? One solution for skittish investors: Invest in stock mutual funds and ­exchange-traded funds (ETFs) that are resistant to corrections and that are strong performers overall. 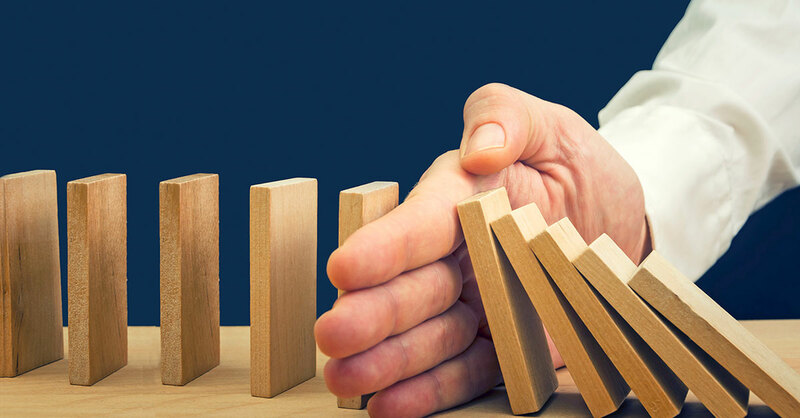 It’s not surprising that 14 of the Steady 19 funds stress dividend-paying companies, which tend to be large, reliable and profitable businesses with strong cash flow. That includes the second-least-volatile fund, Invesco Dividend Income, which averaged a drop of just 4.4% during the five market corrections and whose recent yield was 2.72%. Although some companies pay dividends greater than what their cash flow justifies, conservative investors have long relied on dividend-paying stocks to drop less than the overall market in stormy times. Another fund among the Steady 19, WisdomTree US High Dividend, which averaged an 8.2% loss during corrections and an 11.7% annualized return, holds more than 400 large-cap stocks with hefty dividends. Its recent yield was 3.75%. The highest-yielding fund among the Steady 19 is Invesco High Yield Equity Dividend Achievers ETF, with a recent yield of 4.33%, average loss of 8.1% over the five corrections and an annualized return of 11.6%. Some funds in the Steady 19 focus on stocks that have the greatest potential to increase dividend payouts over time—Vanguard Dividend Growth, with an annualized return of 12.3%…City National Rochdale Dividend & Income, with a 9.7% return…and First Trust Value Line Dividend ETF, with a return of 12.5%. In contrast, the strongest-performing fund, AMG Yacktman Focused, with an annualized return of 14.8% and losses averaging 8.7% during the five corrections, has a different approach. It looks for undervalued stocks regardless of their dividend payouts, and at times when it is difficult to find them, the fund allows the cash portion of its portfolio to build until bargains emerge. At the end of 2018’s third quarter, the fund had 24% in cash. Other cash-building funds on the list include Intrepid Endurance with 54% in cash, and Symons Value Institutional with 9%. Among the Steady 19 funds are seven ETFs, and like most ETFs, these tend to be notably “tax efficient”—meaning that they don’t sell the stocks they own very often, limiting capital gains distributions for shareholders. Beyond those ETFs, one of the Steady 19 mutual funds, SEI Tax-Managed Volatility, also stresses low tax consequences for investors. It had a 12.2% annualized return. 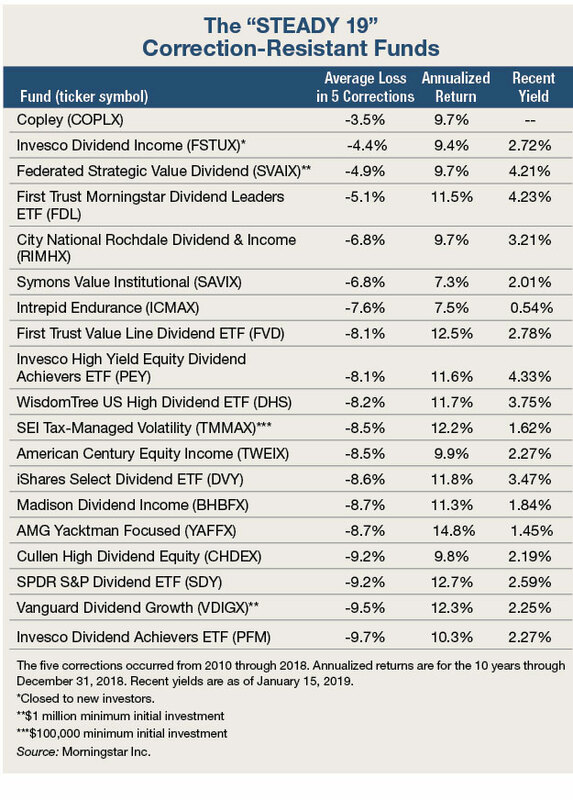 The Copley fund—which had the smallest average loss over the five corrections, just 3.5%, and ranked 15th in overall performance—has an interesting history. For nearly the entire 10-year period studied, it was managed by a former women’s handbag manufacturer named Irving Levine who started the fund when Jimmy Carter was president and who gained a reputation in the fund industry as “Mr. Steady.” Levine, who was manager of the fund until he died last May at age 96, rarely sold stocks in his portfolio and typically held about 30 large, dividend-paying companies, mostly in utilities, energy and financial services. The Copley fund now is managed using the same strategy by Chicago-based North Star Investment Management. The analysis that Morningstar performed based on criteria set by ­Bottom Line Personal looked at more than 1,000 diversified stock funds and ETFs with at least a 10-year record of performance. The five corrections that were studied: April 4 to July 7, 2010…April 29 to October 3, 2011… May 21 to June 2, 2015…January 26 to February 8, 2018…and September 21 to November 23, 2018. Based on closing prices, the 2011 correction fell just short of a 20% loss—the definition of a bear market. In addition to eliminating funds with losses that averaged 10% or more, the analysis dropped those with a loss during any single correction of more than 14% (the S&P 500’s average loss during those corrections). The analysis also eliminated funds requiring minimum initial investments greater than $1 million. In the final list of 19 funds, losses during the five corrections averaged 3.5% to 9.9%. In the performance analysis of the 10 years through ­December 31, 2018, only one of the funds topped the S&P 500’s 13.1% annualized overall return—AMG Yacktman Focused, with 14.8%. But 11 of the funds gained an impressive 10% or more.